2. A knock-in feature that causes the option to become effective only if the underlier first reaches a specified barrier level. They are just simple (OTC) call and put options but with price barriers embedded where the functionality of the option begins or ends. Barrier options are bought and sold in much the same way as OTC vanilla options (there are no listed barrier options). Premiums are paid in advance and a margin account can be established at the discretion of both parties. Some barrier options offer a rebate if the option hits the barrier. Barrier options were created as a way to provide some of the protection/participation value of an option at a lower premium. 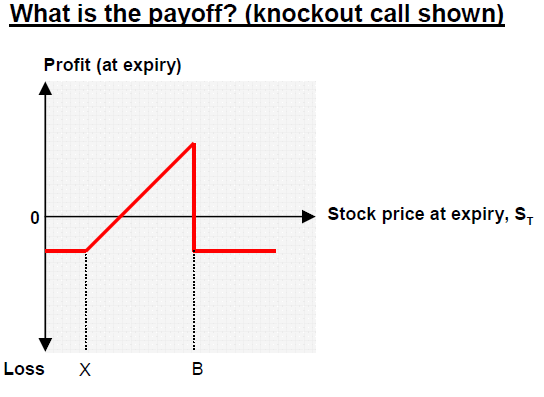 For pure option plays, investors widely perceive other derivative products as more profitable and logical to use. However, barrier options form a critical part of a range of structured products and exotic derivatives (e.g. Bonus Certificates, ladder options). Barrier options can enable investors to take an aggressive view on skews and e.g. sell volatility at lower strikes than would normally be liquid. The option is only activated dependant on the barrier requirements. If not, it’s worthless. Hedging of the risk for the option writer can be difficult especially if the option is near the barrier level as it approaches expiry.